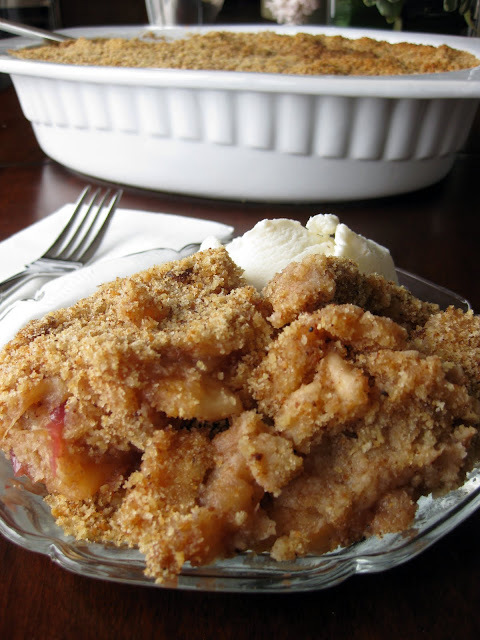 This healthy dessert is an easy recipe for bread pudding, akin to an apple brown betty. 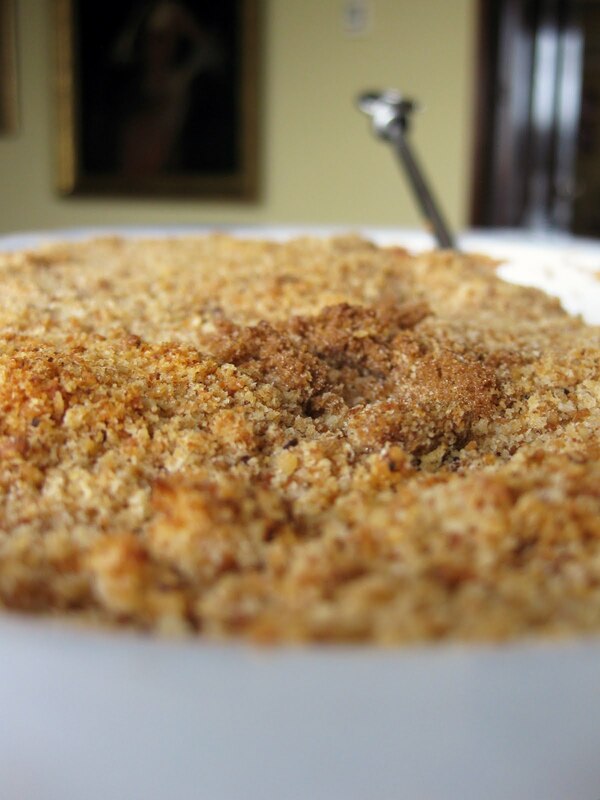 Looking to use up leftover breadcrumbs, bread, cake or cookies? This bread pudding recipe certainly fulfilled that need for me: I had over 20 cups of prepared plain breadcrumbs in my pantry, and needed to find some constructive uses for them. Pronto. A little searching led me to various bread desserts and uses for breadcrumbs. After a little more searching, I learned that several Scandinavian desserts are made from the crumbs of macaron cookies. These bread based desserts typically incorporate lemon juice, lemon zest, and sometimes lignonberry preserves. This healthy bread pudding is a relative of a traditional Dutch dessert. There are also similar Scandinavian desserts. I found a representative recipe online and tweaked it to add that lemony zing. I replaced hard-to-find lingonberries with cranberries, and threw in some freshly-ground nutmeg (because I was excited to try out my new nutmeg grinder) and a little cinnamon. I would have tried using macaron, cake, or cookie crumbs, too, if I hadn't had such an urgent need to use up my breadcrumb surplus. A similar basic American dessert exists. 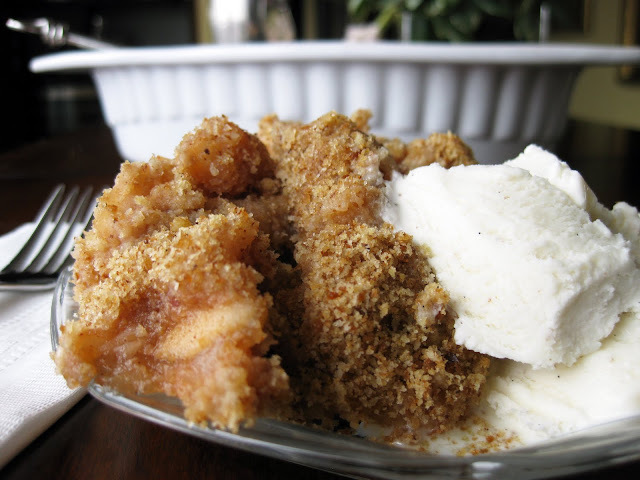 Called an Apple Brown Betty, it is usually based around a few similar core ingredients: bread cubes/crumbs, brown sugar, butter, and fresh apple slices (rather than a homemade applesauce). Both approaches make fairly healthy desserts: bread and apples are the main ingredients, and you can cut back on the butter and sugar if you find them excessive. More than a bread dessert, this is an applesauce dessert, as you can see in the photo above. It is worth noting that this is not an apple crisp, and doesn't taste like one. The topping is not meant to be crunchy. The ultimate flavor is like eating warm, home-made applesauce on buttered toast. Although I enjoyed this dessert, I can't give it a resounding three cheers. Everyone enjoyed it, but I think that it will appeal to some people, while others will be left hankering for an apple crisp. For me, the bread taste was a little strong, and I didn't even use all the bread crumbs the recipe called for. 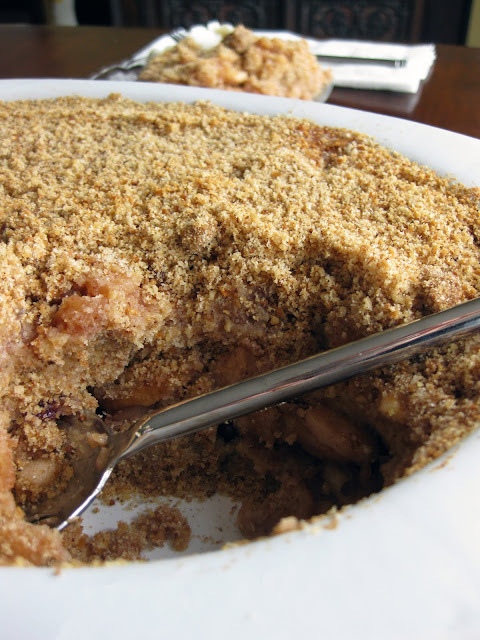 I would have enjoyed this more if I had made it with homemade, not store-bought, bread crumbs (especially crumbs from a rich egg bread like brioche or challa, or crumbs from leftover cake or cookies), and if the applesauce had had a little more moisture. Like many healthy desserts, this bread pudding is light on sugar. You need to adjust for sweetness based on the applesauce you make or buy and your own tastes. I thought the dessert needed more sugar and more liquid. I tried to meet these needs in a few different ways: by adding a scoop of whipped cream and/or ice cream when serving the dessert, by mixing butterscotch baking morsels into the layers when re-heating, and by adding a small amount of additional liquid to the apple bread pudding layers after finding the baked product too dry for my taste (~3/4 cup milk or apple cider). These all did a great job of improving the ad-hoc apple brown betty. Personal tastes and expectations vary, as would the moisture content of your homemade applesauce. You may find that none of these alterations are necessary to perfect this recipe for your palate. On the bright side, it's a very easy dessert recipe to throw together if you already have applesauce and bread on hand. Adapted from an Epicurious Recipe. ~4-5 cups homemade chunky applesauce (recipe follows) Incorporating more applesauce into the layers of the dessert will result in a more moist bread pudding. Adding lightly sweetened whipped cream and/or vanilla ice cream as a topping when serving also benefits this dessert by adding moisture and sweetness. In a large skillet melt butter over moderate heat and stir in bread crumbs. Cook bread crumbs, stirring constantly until golden, about 5 minutes. In a 1 1/2-quart soufflé dish layer 1 cup crumbs, 2 cups applesauce, and 1/2 cup preserves and repeat. Sprinkle remaining 1/2 cup crumbs on top and bake the bread pudding in middle of oven 25 minutes, or until top is golden brown. Breadcrumb pudding may be made 1 day in advance and kept covered and chilled. Reheat bread pudding in a 325°F oven before serving. Garnish with whipped cream and/or vanilla ice cream. This applesauce dessert is quite adaptable. If you find the finished product a little dry, try mixing in a small amount of additional liquid (up to 3/4 cup milk or apple cider). I improved a few of my batches this way, while others I served with a side of ice cream, whipped cream, or baked with the addition of butterscotch morsels. I also took one of the baked applesauce bread puddings and placed it in a trifle dish with alternating layers of whipped cream with butterscotch morsels. All of these variations were quite good! Peel and core apples and cut into 3/4-inch pieces. In a large heavy saucepan or pot, bring water, apples, sugar, nutmeg, cinnamon, and salt to a boil. Simmer, stirring occasionally, until apples are soft and starting to fall apart, about 25 minutes. Remove from heat and mix in lemon juice, lemon zest, and cranberries. Applesauce may be made 3 days in advance and kept covered and chilled. Makes about 5 cups.